Music for Everyone are key partners in the Nottingham City Music Hub. 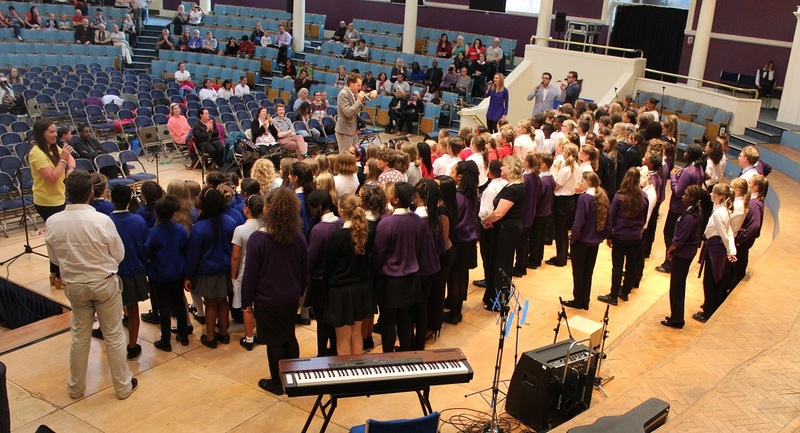 Since 2012, MfE have been working closely with the Nottingham Music Service to offer a range of opportunities for City Schools in line with the National Music Plan. The annual ‘Big Sing’ celebration takes place over two concerts at the Nottingham Albert Hall. In preparation for this event, each school can receive preparatory singing workshops from our professional staff and receive helpful resources. A key aspect of the Big Sing is our inspirational professional ensembles which perform at the concerts at also work with pupils beforehand to prepare some music for the concert. We were delighted to have a cappella vocal ensemble Apollo5 with us for the Big Sing 2015. In addition to the Big Sing, we also have cluster choir opportunities at Christmas concerts with performances at both the Albert Hall and Royal Concert Hall in Nottingham. Professional development and support for singing in schools is also available.